Pumpkins (Curcubita pepo) are a type of squash and a highly versatile culinary vegetable. From pumpkin pie and pumpkin bread to pumpkin risotto, they can be made into virtually any dish and preserve most of their nutritional value and health benefits. The culinary vegetable is a rich source of vitamin A, the ultimate nutrient for healthy vision and beautiful skin. A generous dietary intake further promotes the health of mucous membranes at the level of the nose, mouth and stomach lining and provides benefits for the immune system. Pumpkins boast a high fiber content and are an ideal food to regulate blood sugar levels in diabetics as well as exhibit tonic properties, boosting energy levels and reducing fatigue. Pumpkins are full of antioxidant carotenoids, lutein and beta-carotene which offer protection against free radical damage, inflammation and related illnesses such as diabetes, heart disease, even cancer. Rich in fiber and low in fat, the average pumpkin helps regulate cholesterol levels and promotes colon health and has a laxative effect for constipation relief. Research shows eating pumpkin helps regulate post-meal insulin and blood sugar levels, making it a great food for diabetics and anyone with high blood sugar levels. 1) Weight loss. With only 26 kcal/100 g of flesh, 91.6% water and less than 0.1% fat, pumpkin is an ideal food if you are looking to lose weight. You can enjoy one or two healthy servings of sweet baked pumpkin instead of sugared candy or pastry and lose weight slowly but steadily, without having to resort to any diet plan. However, it is important to substitute other not so healthy elements of your diet with healthier options such as pumpkin in order to see results. Just adding calories will not produce results in terms of weight loss. 2) Treats constipation naturally and promotes colon health. If you have ever eaten a slice of baked pumpkin, then you know that it will send you to the bathroom in no more than an hour, even if you are feeling a bit constipated. This is because pumpkin is a good source of fiber with strong laxative properties. The good amounts of dietary fiber in this culinary vegetable add bulk to stools and encourage easy bowel movements, relieving constipation. The more frequent our bowel movements, the less our colon is exposed to toxins, which means fiber-rich foods such as pumpkin actually promote colon health. Moreover, according to research, a diet consisting of fiber-rich foods may significantly decrease colon cancer risks. 3) Promotes cardiovascular health. Having a good fiber content, pumpkin prevents too much fat from being absorbed at intestinal level and thus indirectly contributes to lowering blood cholesterol levels. Since it basically has no fat (0.1%), especially no harmful saturated fatty acids and no cholesterol, regular consumption favors a healthy blood lipid profile and supports artery health. Pumpkin seeds are an even richer source of dietary fiber and healthy mono and polyunsaturated fatty acids, further contributing to cardiovascular health. 4) Incredible source of vitamin A. Pumpkin provides 246% of the RDA of vitamin A, as well as vitamin A precursors with potent antioxidant activity. Vitamin A-rich foods such as pumpkin strengthen the immune system by stimulating the production of lymphocytes. Because it ensures healthy eyes, nose, mouth, lungs and stomach mucous membranes, vitamin A boosts immunity and reduces the risk of recurrent infections and disease. 5) Rich in antioxidants. Pumpkin owes its deep orange pigment to lutein, alpha-carotene and beta-carotene, three carotenoids with powerful antioxidant activities. Lutein, for example, is physically present in our retina and is responsible for maintaining good eyesight well into old age. Studies link lutein to a decreased risk of macular degeneration (loss of central vision). The high amounts of beta-carotene in pumpkin prevent cell damage caused by free radicals from accumulating and causing mutations that may lead to cancer. Because it is also a precursor for vitamin A, a part of the beta-carotene we absorb from eating pumpkin gets turned into retinol, or vitamin A in our gut. 6) Good source of vitamin C, copper and B vitamins. 100 g of pumpkin supplies us with 15% of the RDA of vitamin C and 14% of the RDA of copper. Both nutrients are essential for delaying aging signs such as wrinkles, saggy skin, gray hair and discolored iris. Both boast outstanding antioxidant activity within the human body. Copper, for instance, makes up a superoxide dismutase enzyme which acts as a powerful natural antioxidant defense system. Conclusion. One serving of delicious baked pumpkin or pumpkin soup is full of antioxidants, vitamins A, C, beta-carotene, fiber and small amounts of other essential nutrients. With no cholesterol, no unhealthy saturated fatty acids and a high water content, pumpkin is a great food for people struggling to keep their weight, blood sugar and cholesterol levels under control. 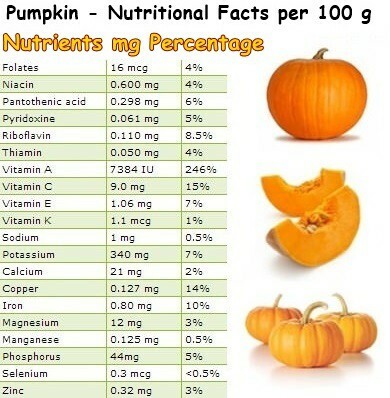 Pumpkin contains no saturated fats or cholesterol. So pumpkin helps to save our heart. Pumpkin is a great source of dietary fiber and unsaturated fatty acids, which are beneficial for heart health.